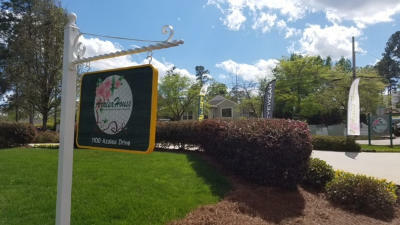 The Azalea House is one of the premier, off-course hospitality facilities patrons visit during Masters week. Just one block off Washington Road, the Azalea House provides patrons access to a premium open bar, chef’s catered buffet all day and an open fire grill in the evenings, along with all your transportation needs.All week long, the house hosts friendly virtual golf competitions to benefit various charitable organizations. This year FlightScope will be the technology provider for the virtual golf competitions throughout the week, including the CaddyBash benefiting Caddy For A Cure on Monday night, where they'll be raising money and showing the NCAA National Championship game! Golf Talk America will also be doing LIVE shows all week long from the patio - their podcast is available daily on www.PGATOUR.com/podcasts.If you’re attending The Masters, The Azalea House would love to have you! To learn more about purchasing a pass, visit https://azaleahospitality.com/azalea-house/.